Barron found support from Chelsea Clinton, with the former first daughter saying he "deserves the chance every child does — to be a kid"
President Donald Trump, first lady Melania Trump and son Barron Trump walk in the inauguration day parade in Washington, Friday, Jan. 20, 2017, after he was sworn in as the 45th president of the United States. A "Saturday Night Live" writer has been suspended indefinitely after tweeting a poorly received joke about Donald Trump's 10-year-old youngest son, Barron. This isn't the first time "SNL" has gotten in trouble for joking about the president's children. In 1993, then-cast member Mike Myers had to write an apology letter to the Clintons after a skit that mocked Chelsea Clinton. "She's a kid, a kid who didn't choose to be in public life," ''SNL" executive producer Lorne Michaels said at the time. He also acknowledged that said his show treated then 9-year-old Amy Carter "a little rougher" during the 1970s when Jimmy Carter was in the Oval Office. 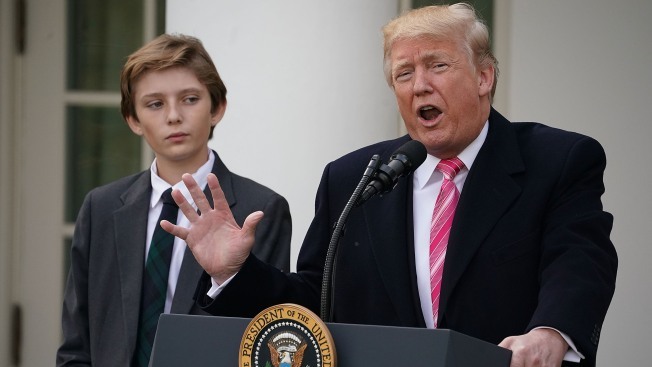 The current controversy over Barron Trump comes as President Trump has lashed out at the way "Saturday Night Live" has lampooned him, with the president saying Alec Baldwin's semi-regular portrayal of him "stinks" and calling one of the skits a "hit job."